We've been waiting for the third season of Stranger Things almost as long as the Mind Flayer has been waiting to escape from the Upside Down, and a new action-packed trailer has finally arrived, giving us plenty of scares and fun and the best of your dad's favorite classic rock radio station. But what does it all mean? The new trailer is slick and brisk, but there's a lot packed into its two-and-a-half minutes. Naturally, we have lots of questions and plenty of guesses about what's going to happen next. 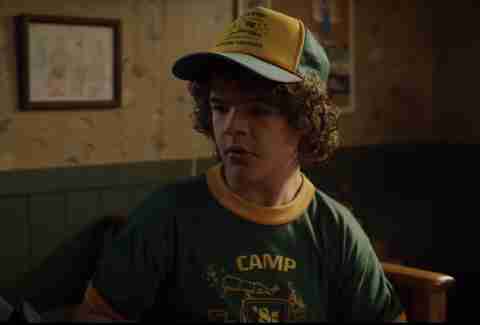 The trailer begins with Dustin returning home from what looks like summer camp, if his matching hat and T-shirt are any indication. Science nerd that he is, "Camp Know Where" turns out to be a science camp, hence the microscopes all over his shirt. And, aww, his friends missed him! So they decide to scare the living daylights out of him. Like friends do. What is that antenna for? 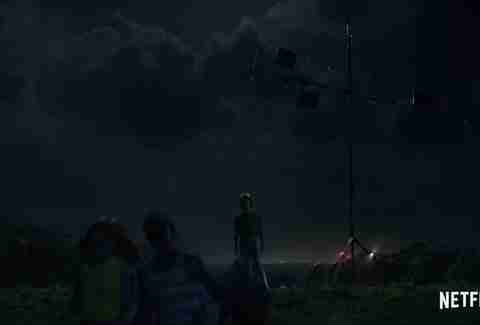 Next, we see our favorite Hawkins, Indiana miscreants banding together to set up a makeshift antenna on top of a large hill. What exactly is going on here? Are they trying to set up pay per view? Contact aliens? Frequency themselves? The first episode of the third season is titled "Suzie, Do You Copy?" so maybe Dustin met a nice girl at science camp he wants to get in touch with. 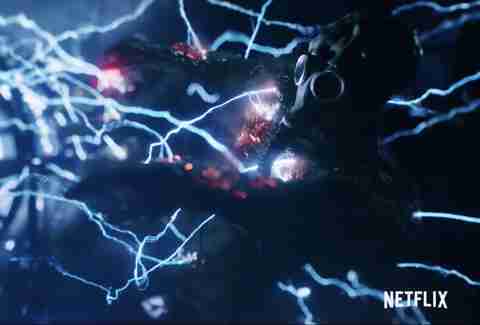 It could also have something to do with the weird lightning machine we see later in the trailer (see below), and will definitely have everything to do with the Upside Down. Speaking of which, what's going on with Eleven's mirror vision world? We were introduced to this aspect of Eleven's abilities -- a kind of dimly-lit Upside Down-adjacent dimension, where she can walk around and search for people -- all the way back in Season 1. But this season, it looks like something's taken a turn, and her meditative space isn't as safe as it used to be. 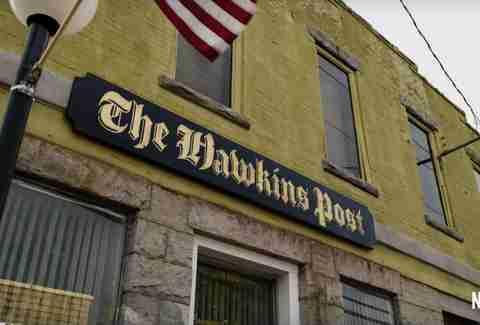 Is The Hawkins Post going to be a big deal this season? In Season 3, we'll be introduced to new cast member Jake Busey as "Bruce," a sleazy journalist for the local newspaper with "questionable morals." It also looks like Nancy and Jonathan are going to visit the offices, maybe because someone else has gone missing this time, or maybe to try to clue the rest of the town in to the horror that's lurking beneath the surface. Who is this mysterious assassin in the funhouse? Nothing good ever happens at the fair in a show like this, especially not when you have creepy armed dudes sneaking around all over the place. Right after this guy appears, stalking through the hall of mirrors with a silencer on his gun, we see Sheriff Hopper say, "It is important to me that you feel safe. I want you to feel like this can still be your home." If anyone can save Hawkins from an armed threat, Hopper probably can. What's all over Billy's arm in the shower? After his stepsister Max made it clear in Season 2 that she wasn't going to let Billy mess around with her friends anymore, it seems Billy decided to get himself a job as a lifeguard at the local pool. Now, not to be a buzzkill, but we all know public pools have parasites galore, so in a normal world Billy could have just contracted some weird fungal amoeba. But this isn't a normal world, and it probably has something to do with the Mind Flayer, the malevolent presence trying to break out of the Upside Down. There's a theory going around that the Mind Flayer is trying to spread something through disease carried by rats -- which has been teased by the show on Twitter and by a pretty horrifying rat shot in this trailer. We also know that Episode 7 of the new season is called "The Bite." What is… going on here? 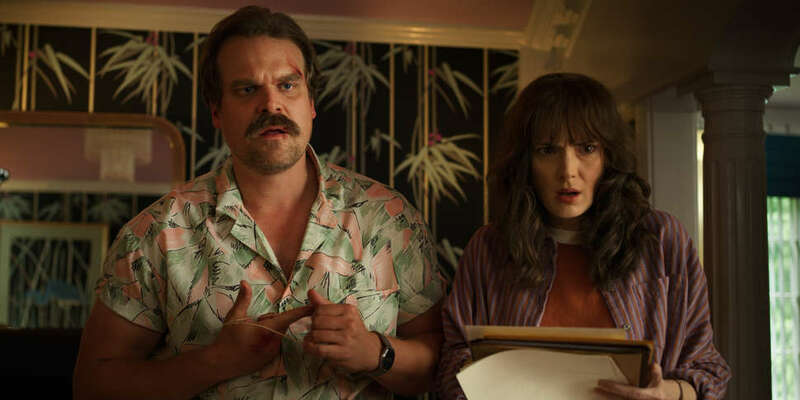 The best thing about Stranger Things is that you really have no idea what's coming season to season. Last season, a cute little tadpole turned into a beastly monster that tried to eat the kids. This season, the mythology is expanding once again, and it kinda looks like the government or another scientific organization has gotten wind of Hawkins' connection to a parallel world. We see a couple shots of this gas mask-wearing mystery person being thrown through the air by sheets of lightning, and seconds before, if you pause and go through frame by frame, you can actually see a giant machine being turned on. A quick peek into the IMDb list of all the cast in the new season has actress Jennifer A. Martin playing "Gravitron operator," so that's probably what that is. But why would you need a gas mask to use it? Yes! The Princess Bride star Cary Elwes has joined this season as Mayor Kline, described as "your classic '80s politician -- more concerned with his own image than with the people of the small town he governs." There's a chance he could be in on whatever organization's plan to gravity-hack into the Upside Down, or he could just be a self-obsessed dummy without any truly malicious intent. 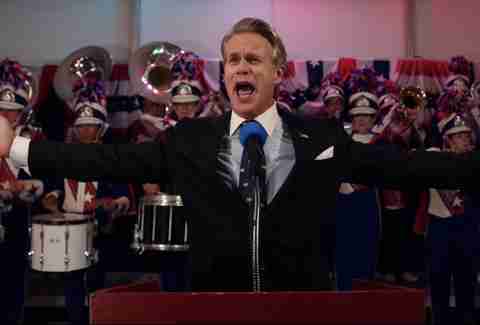 Hey, he threw the people of Hawkins a fair! That's something, right? If the fans' theory about the rats holds true, these wall-eyed people could be two zombified minions of the Mind Flayer, having been bitten by the infected rats and forced to spread the infection. And what better place to do it than at a town fair where everyone's invited? What is this new monster in the hospital? We've seen the Demogorgon, we've seen the demo-dogs, we've seen the Mind Flayer, but never have we seen something as gross looking as this. There's really no way of guessing exactly what this thing is, but it's probably from the Upside Down, and its purpose is probably bad.